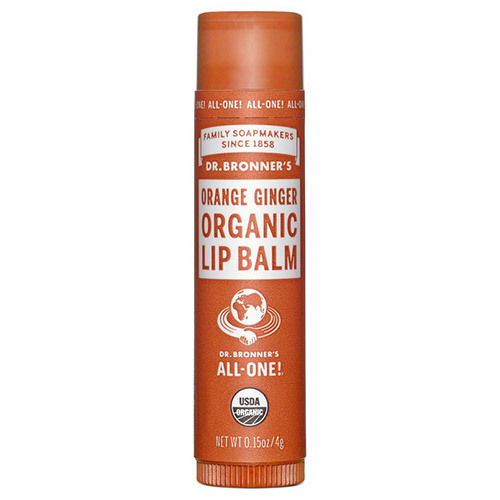 Dr Bronner`s Organic Orange Ginger Lip Balm, made with organic beeswax, provides a protective barrier to the elements without any synthetic ingredients. Organic jojoba, avocado and hemp oils assist moisturisation and provide excellent lip protection. Only the finest organic essential oils are used for fragrance. Dr Bronner`s lip balms are certified organic because what you put on your lips goes into your body. Organic Persea Gratissima (Avocado) Oil, Organic Beeswax, Organic Simmondsia Chinensis (Jojoba) Seed Oil, Organic Cannabis Sativa (Hemp) Seed Oil, Organic Citrus Aurantium Dulcis (Orange) Oil, Organic Zingiber Officinale (Ginger) Root Oil, Tocopherol. Use as per required to moisturise dry lips. Below are reviews of Dr Bronner`s Organic Orange Ginger Lip Balm 4g by bodykind customers. If you have tried this product we'd love to hear what you think so please leave a review. Pleasant taste and consistency, long lasting, would buy again.